↤ 1 Our main reference for Blake’s work is D. V. Erdman, ed., The Poetry and Prose of William Blake (Garden City, N.Y.: Doubleday, 1965), hereafter referred to parenthetically in the text as “E” followed by a page number. “K” followed by a page number indicates the location of a passage in G. Keynes, ed., Blake: Complete Writings (London: Oxford University Press, 1969). “The[e] Mental Traveller” describes a cycle in which two figures, one male and one female, grow from infancy to old age and back to infancy again. Each grows younger as the other grows older, so that each is oldest when the other is at the point of birth. This curious round of change becomes understandable when we realize that the figures personify two complementary principles. However, the interpretation of these principles and of their cycle of change has proved to be puzzling and controversial. Of two main critical traditions, the earlier represents the cycle as essentially prototypical of cyclic process, and in particular of historical cycles.2↤ 2 This tradition had its starting point with W. M. Rossetti in Alexander Gilchrist, Life of William Blake (1880: rpt. New York: Phaeton Press, 1969), II, 112-13, and with E. J. Ellis and W. B. Yeats, The Works of William Blake (1893; rpt. New York: AMS Press, 1973), II, 34-36. It was further developed, indirectly, by W. B. Yeats, A Vision (London: Macmillan, 1937), and, directly, by Kathleen Raine, Blake and Tradition, I, 302-25. Such a generalizing approach is out of character for Blake, and the cyclic processes of history are certainly within the grasp of “cold Earth wanderers,” while this cycle is explicitly said to go beyond their knowledge. However, this tradition incorporates, in a simple and natural way, the fact that each principle develops to its fullest manifestation and then diminishes in the face of the growing opposing principle. The later tradition involves interpretations in terms of the so-called “Orc cycle”: the Male Babe personifies revolt (Orc) and ages into a personification of oppression (Urizen).3↤ 3 The “Orc cycle” tradition was initiated by Northrop Frye in Fearful Symmetry (Princeton: Princeton University Press, 1947), p. 229, and has been taken up by a number of scholars, including John H. Sutherland, “Blake’s ‘Mental Traveller’,” ELH, 22 (1955), 136-47, reprinted in Judith O’Neill, ed., Critics on Blake (London: Allen & Unwin, 1970), pp. 69-78; Morton D. Paley, “The Female Babe and ‘The Mental Traveller’,” SiR, 1 (1962), 97-104, incorporated, in somewhat altered form, in Chapter 5 of Paley’s Energy and the Imagination (Oxford: Clarendon Press, 1970), pp. 122-41; and Hazard Adams, William Blake: A Reading of the Shorter Poems (Seattle: University of Washington Press, 1963), pp. 77-100. In Anatomy of Criticism (Princeton: Princeton University Press, 1957), pp. 322-23, Frye expresses a view more akin to the earlier tradition. Such a cycle is complete half way through the poem, and in spite of various attempts to interpret the Female Babe, the second half of Blake’s cycle remains logically impertinent.4↤ 4 Frye (Fearful Symmetry, p. 444, n. 7) expressed dissatisfaction with his own reading of the Female Babe as “imaginative achievements,” a reading followed by Sutherland and Adams, and later (Anatomy of Criticism, p. 322) he identifies the female figure with “the natural environment.” Paley (“Blake’s ‘The Mental Traveller’,” pp. 100-01), who points out the significance of the concept of the Female Babe, finds Frye’s later reading also unsatisfactory, and sees her instead as a united form of the “numerous evil females of Blake’s pantheon.” In both traditions, the cycle is seen as repeating. The reading we give in this paper follows the earlier tradition to the extent that each principle is seen as aging into a mature form of itself. 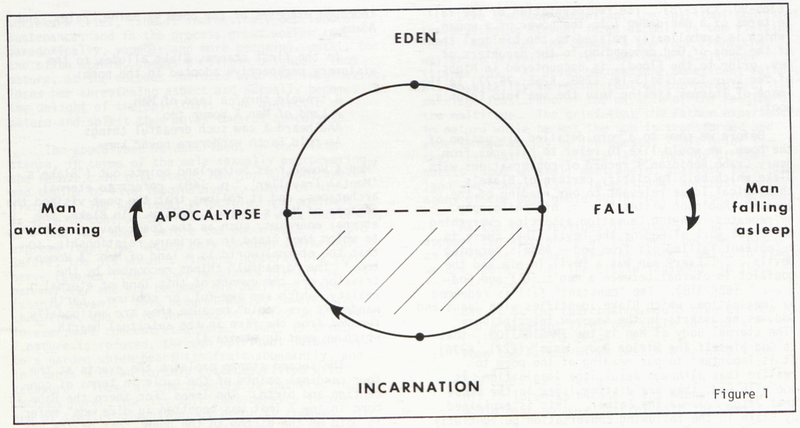 However, our reading differs from that of the earlier tradition in that the cycle is specifically seen as the theological cycle of Man’s fall from and return to Eden. It is our aim to show that “The Mental Traveller” portrays the successive states through which Man passes on his eternal journey, as determined by the complementary interplay of two principles in him: the Spiritual, expressed through his imaginative faculty, and the Natural, expressed through his earthly nature.5↤ 5 We thus agree with John Sampson, The Poetical Works of William Blake (1905; rpt. Boston: Milford House, 1973), p. 273: “The poem . . . must be understood as a picture of man’s spirit, passing through successive mental states, and at last returning, ‘in endless circle,’ to the point from which he started. In other words it is a restatement of Blake’s favourite doctrine of constant generation and regeneration.” However, Sampson does not elaborate his view. This theme of Man’s eternal journey was of profound importance to Blake, and inspires his entire mythology, so that the poem emerges as a compact counterpart to his major work, and a summary of his spiritual vision. is dominant, the states of Man are those associated with the apocalypse and Man’s sojourn in paradise.7↤ 7 In identifying the two components of Man as “Spiritual” and “Natural,” we follow Blake’s occasional usage. For instance: “The Natural Body is an Obstruction to the Soul or Spiritual Body” (Anno. Berkeley, E653, K775). Error is identified with Nature: “Error or Creation will be Burned Up . . . ” (VLJ, E555, K617). There is one state where there is no error, and in this state Man is wholly divine and coincident with God.8↤ 8 Cf. “God is Man & exists in us & we in him” (Anno. Berkeley, E654, K775). For Blake’s theology, we refer the reader to Frye, Fearful Symmetry, especially Chapter 2, “The Rising God,” pp. 30-54. Another useful account is contained in Albert S. Roe, Blake’s Illustrations to the Divine Comedy (Princeton: Princeton University Press, 1953), pp. 8-29. This state, the state of Eden, closes the biblical narrative into a circle.9↤ 9 We differ here from Frye (Fearful Symmetry, p. 386). He rejects the idea of “pulling the Bible around in a circle” on the grounds that that would imply unending time, which would pervert the biblical meaning of the word “eternity.” However, the gap between the two ends of the biblical narrative is included in Blake’s cycle and transcends time. We contend that “The Mental Traveller” describes this same circle. Because Blake shows the continuity of states, the circle appears to be a repetitive cycle, but is in fact merely complete. The poem is anti-Aristotelian and, like eternity, has no beginning, middle, or end. In Blake’s vision in the poem, Man, composed of contrary but complementary principles, is seen as a continuous progression of states which in themselves form a unity, the perfect form of the circle. The two principles in Man, the Spiritual and the Natural, are personified, respectively, by the principal male and female figures of the poem, the age of each representing the extent to which the corresponding principle manifests in the being of Man. The cycle of the poem may be graphically represented as in Figure 1. 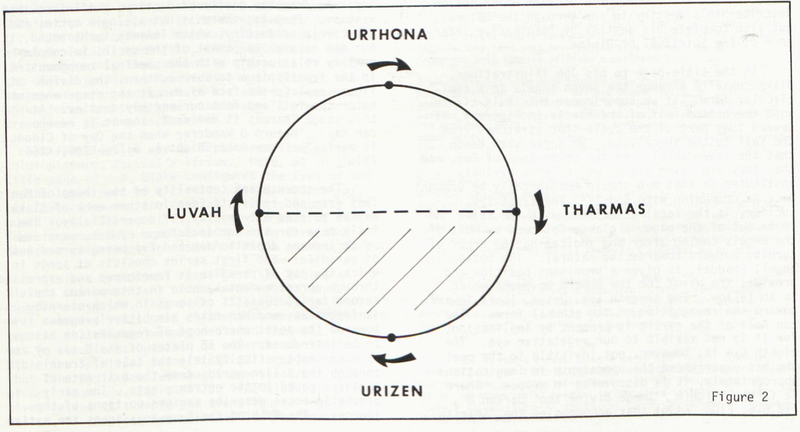 The poem begins at the point, shown at the bottom of the circle in Figure 1, where the Natural principle is in its fullest manifestation, and the incarnation of the Divine into the world of the Natural takes place. This incarnation is represented by the birth of the Male Babe, who is most naturally associated with Jesus. As the Spiritual gains in strength, the Natural principle becomes correspondingly less dominant until, at the left-most point of the circle, it is overpowered by the Spiritual principle. In the life-cycle of Man, this overpowering of the Natural by the Divine corresponds to the spiritual awakening of Man at the apocalypse. In the continuing process of the Last Judgment, the errors of the natural world are progressively destroyed as eternal truths are recognized. This process reaches its completion only when the natural delusion has decreased to vanishing point and all creation is consumed. Here, at the topmost point of the circle, Man finds himself in the state of Eden, where he is coincident with God, the “Heavenly Father.”10↤ 10 “ . . . the Spiritual Body or Angel . . . always behold the Face of the Heavenly Father” (Anno. Berkeley, E653, K774). When the Natural principle reappears as the Female Babe, it is in a growing phase, and increases in strength until, at the right-most point of the circle, the Spiritual is drawn into its power. This overpowering of the Divine by the Natural corresponds to the fall, where Man sinks into a spiritual sleep.11↤ 11 Just as the Last Judgment is seen as a process lasting a full half-cycle (from the incarnation to the state of Eden), so the fall is seen as a process lasting the remaining half-cycle (from the state of Eden to the state where the incarnation takes place). However, we use the word “fall” to denote the specific stage of the process where the Natural principle attains dominance over the Spiritual. The Natural principle continues to gain in strength, while the Spiritual principle grows correspondingly weaker, until Humanity identifies itself with purely natural Man, who lives in the state of the earthly paradise, or lower garden. Thus we arrive again at the point where the incarnation of the Spiritual principle is to take place. The images that Blake uses in the poem to express the varying relationships of the two principles, especially at the cardinal points of the cycle, have their parallels in the biblical narrative and are used in similar contexts elsewhere in Blake’s work.12↤ 12 The parallels for imagery at the points of the fall, incarnation, and apocalypse have been pointed out by various writers. Of these writers, Raine (Blake and Tradition, I, 306-25) offers the most comprehensive identifications. Raine has also been most successful in tracing Blake’s imagery for the fall. In his earlier work, Blake, possibly inspired by Thomas Taylor’s account of the Persephone myth (see Raine, I, 67, 133), concentrates on the theme of the descent of the soul, personified by a female figure (Lyca, Thel, Oothoon, the early Vala). The torture of the Male Babe is fairly closely paralleled in Jerusalem (66: 17-33, E216, K702; 68:57-58, E220, K706-07). The sexual act as metaphoric portrayal of the apocalypse (implicit in the biblical image of the Bride and Bridegroom) is found as part of a prophetic vision in the “Preludium” to America (2:3-4, E50-51, K196). The banquet encountered towards the end of the quarter cycle leading to the state of Eden (corresponding to the “supper of the great God” at the Last Harvest and Vintage, in Rev. 19:17) is the golden feast of the Eternals described in Night 9 of The Four Zoas begin page 186 | ↑ back to top (E385-90, K372-78). The representation of the fall in terms of a man drawn into the power of a woman (which is symbolically related to the biblical theme of the Sons of God descending to the daughters of men, prior to the Flood), is encountered in Night 1 of The Four Zoas (5:13-14, E298, K266: 76-77) in the image of Tharmas sinking into the sea into Enion’s woof. Jesus, therefore, personifies to Blake the Spiritual principle in its early stages, when it is still weak and at the mercy of the Natural. The Father is the Spiritual principle when it is dominant and nature is subjugated. No short reading of “The Mental Traveller” (E475-77, K424-27) can do justice to its rich and varied allusions. We wish primarily to associate the narrative in the poem with the biblical narrative, indicating parallels in Blake’s other works where these appear helpful, in order to show that the cycle of the poem is that of Man’s eternal journey. Where we pass over details, we may be understood to accept the excellent and generally thorough exegeses of the poem by Raine, Paley, and Adams. “Men & Women,” as Sutherland points out (“Blake’s ‘Mental Traveller’,” p. 140), refers to eternal archetypes, and it follows that the poet visited the regions of Man’s eternal reality. In Blake, the eternal energies, such as the Zoas, have emanations, to which they stand in a primary relationship, so that the eternal world is a land of Men “& Women too.” The “dreadful” things recounted by the traveler are the events of this land of eternal reality, which are awe-ful, or sublime. Earth wanderers are “cold” because they are antipodally removed from the fire in the spiritual hearth, which we meet in stanza 11. The second stanza explains the events at the four cardinal points of the cycle in terms of conception and birth. The lines “For there the Babe is born in joy / That was begotten in dire woe” refer to both of the births in the poem, that of the Boy, and that of the Female Babe. The “joy” is experienced by the principle that is born anew, for it is in a growing and assertive phase, and will triumph over the opposing principle a quarter-cycle later. At the sexual encounter a quarter-cycle earlier, the diminishing principle entered the “womb” of the other, which to it is a “dire woe.” The Boy is conceived at the fall, and the implication is simply that Jesus is born of the flesh. Hence, in “To Tirzah” Blake’s narrator can ask, “Thou Mother of my Mortal part / . . . what have I to do with thee?” (E30, K220), and in The Everlasting Gospel Blake writes of the “Serpent Bulk of Natures dross” (E515, K749) which is to be nailed to the cross. In the case of the Female Babe, the sexual encounter is the “dire woe” of the apocalypse, when nature is subjugated to the Eternal Imagination. The first line of the third stanza, “And if the Babe is born a Boy,” identifies the point at which Blake chooses to begin his description of the traversal of the cycle, that of the incarnation of the spirit into the natural world. Evidently, Blake is interested in charting the “dreadful” events of the spirit, following it in its cycle of evolution, from its birth, through subsequent growth, to its decline. The diverse images of torture that follow evoke associations with Prometheus, Orc, and as Raine suggests, with Dionysus (who was lacerated, and who like Christ had a heavenly father and an earthly mother). However, the most sustained reference is to the suffering of Christ (as is the case in the parallel description in Jerusalem 66). Incarnated in the natural world, the spirit has to undergo the excruciating tensions of the contraries operating in this world: The Old Woman cuts the Boy’s heart out “To make it feel both cold & heat.” As the Boy grows older, thus stronger, his sufferings become less intense. Since she lives “upon his begin page 187 | ↑ back to top shrieks & cries,” she is increasingly deprived of sustenance, and in the process grows weaker and, paradoxically, younger and more becoming, until, in the sixth stanza, she is a “Virgin bright.” Thus nature, as she becomes suffused with the imaginative, loses her threatening aspect and actually becomes the delight of the Spiritual. The dialectic of nature and spirit thus moves towards apocalypse. The apocalypse is described, in the sixth stanza, in terms of the male sexually overpowering the female. In this state, Man (or Albion) awakes and begins to live imaginatively, aware of his divinity. The Spiritual principle, now dominant, is able to control the natural world with increasing ease and joy, where before the apocalypse it could express itself in nature only through suffering. Before, the Old Woman’s fingers numbered his every nerve (stanza five); now, he plants himself in all her nerves, and she becomes his dwelling place (stanza seven). This natural world, however, is shrinking, and as it shrinks, it yields up a harvest in ever more concentrated form. Thus, in stanza 7 nature is reduced, through spiritual husbandry, to a garden which bears its fruit abundantly, and in stanza 8 to an earthly cottage, filled with treasure. Thus, as the treasure is gathered in, it becomes purer, for its spiritual density increases, and of smaller dimension, as error is removed. The nature of this treasure is explained in stanza 9. It is the “gems of the Human Soul,” described in images of suffering, drawn from courtly-love poetry: “a lovesick eye,” “the lovers sigh,” “the akeing heart” and “The martyrs groan.” The treasure which nature delivers up is therefore that of the spiritual loves and sufferings of Man on this earth. These have been preserved, and are now brought forth, in ever purer form, to serve as food for the Spiritual: “ . . . the gems of the Human Soul / . . . / . . . are his meat . . . are his drink” (ninth and tenth stanzas). The meaning of the first two lines of stanza eight is crucial, for divergent interpretations of the poem hinge on it: “An aged Shadow soon he fades / Wandring round an Earthly Cot.” In the tradition of Rossetti—Ellis & Yeats—Raine, the “aged Shadow,” fading, is seen as effete, and in the Orc cycle tradition, as restrictive. We suggest that “aged” merely indicates that the Spiritual principle is nearing full manifestation and greatest potency, just as the Female was most powerful when most old. To the natural eye, however, the Spiritual when most manifest is paradoxically least visible, thus becoming a “Shadow” that fades, as it wanders around the last vestiges of the natural in a world that has become nearly completely spiritual. Although eternal substance appears shadowy to mortal man, the poet, the visionary traveler, knows that the world of the Father is the “Imagination the real & eternal World . . . in which we shall live in our Eternal or Imaginative Bodies, when these Vegetable Mortal Bodies are no more” (Jerusalem 77, E229, K717). In this world, the “Land of Men,” the “ . . . Inhabitants [are] walking up & down in Conversations concerning Mental Delights . . . Here they are . . . Conversing with Eternal Realities as they Exist in the Human Imagination . . . ” (VLJ, E552, K613). Paradise is therefore populated with eternal forms. Like the Good Samaritan, the Spiritual nourishes the developing eternal forms as well as the visiting poet: “He feeds the Beggar & the Poor / And the wayfaring Traveller / For ever open is his door” (stanza 10). As Jesus becomes the beneficent Father, his hospitality is reminiscent of the parable of the marriage feast, and of the miracle of the feeding of the multitude. The grief that the Father experienced in nature while he was the Son is transformed and experienced as joy by the guests: “His grief is their eternal joy” (stanza 11). The joy of the guests (whom we shall meet again “scatterd thro’ the land” in stanza 16) is in antipodal contrast to the agony of the Boy, whose sufferings fed the Old Woman. Would have no more quarrel with the Devil . . .
His crown of thorns fell from his head . . . This recurring emphasis on drunken revels in sacred context is explained by Blake’s remark to Henry Crabb Robinson that “What are called the vices in the natural world, are the highest sublimities in the spiritual world” (BBR 316). In the process of the Last Judgment, “Error or Creation” is “Burned Up” (VLJ, E555, K617). In stanza 11 we find fire in the hearth, the center of the divine dwelling. Nature’s last vestiges have begin page 188 | ↑ back to top disappeared into this fire, from which nature is reborn, phoenix-like, as “A little Female Babe.” In stanza 12, she is said to be “all of solid fire/And gems & gold.” Solidity, alien to fire, and characteristic of the natural, already indicates the beginning of the fall. The “gems & gold” which filled the cottage in stanza 8 were associated there with the last transfigured residue of the Natural. Now we encounter the same image once again. It is one that Blake uses elsewhere in his work to describe the adornment of the serpent form (for instance, VDA 8:7, E49, K195), and here it gives a fleeting glimpse of the serpent’s presence in Eden.15↤ 15 Viewing the infant Natural principle as a serpent coiled around the “tree” of the fully manifested spirit, we would, antipodally, view the infant Spiritual principle as a serpent coiled around the “tree” of fully manifested nature. This is supported in The Four Zoas, Night 7 (a), where Orc is described as organizing a serpent body and stretching up Urizen’s tree of mystery (80: 44, 81: 3-5, E349, K324: 152, 162-64). The first tree is the tree of life, and the second tree is the tree of the knowledge of good and evil. And feeds her with the food of Eden . . . This is the Generative world they rememberd the Days of old. In Robinson’s diary we read: “On my inquiring whether the Devil would not be destroyed by God as being of less power—he denied that God has any power—Asserted that the Devil is eternally created not by God—but by God’s permission” (BBR 318). In view of this lack of power on the part of the Divine principle, the birth of the Female Babe is thematically associated with the creation of Adam and Eve, who will disobey the Father. Adam and Eve are to be seen as united in forming the natural component. This tallies with Blake’s Laocoön inscription: “Adam is only The Natural Man & not the Soul or Imagination” (E271, K776), and with the Chapter titles of his Genesis manuscript: “Chapter 1 The Creation of the Natural Man / Chapter 11 The Natural Man divided into Male & Female . . . ” (E667, K933). The growing Natural principle organizes whatever mental forms prove susceptible to her influence: “But She comes to the Man she loves / If young or old or rich or poor” (stanza 13). In this process the “aged Host” is driven out, and he is now a beggar “at another’s door,” rather than the earlier benevolent host. He develops a need for companionship and turns to the maiden. Coming at the stage just before the fall, this action is reminiscent of the Genesis account of the Lord walking in the Garden in the cool of the evening and calling out to Adam and Eve. The Divine—“freezing,” since it has wandered far from the spiritual hearth—now succumbs to the attraction of the Natural, and the fall takes place: “The Cottage fades before his sight / The Garden & its lovely Charms” (stanza 15). With the fall, Man’s perceptions undergo a radical change. His senses conglobe and perceive everything in distorted fashion, round and bounded: “For the Eye altering alters all / The Senses roll themselves in fear / And the flat Earth becomes a Ball” (stanza 16). Blake states elsewhere that “Reality was Forgot & the Vanities of Time & Space only Rememberd & calld Reality” (VLJ, E545, K605). Thus it is that Man begins to live in the fallen world of time and space: Albion has fallen asleep. Fill’d with the wine of anguish . . . They eat the fleshly bread, they drank the nervous wine. In stanzas 20-22 the word “Love,” or a derivative, occurs four times: the food of the banquet is that of natural love. Both principles are in a state of dislocation: they wander “in terror & dismay” (stanza 19). Her flight from him is not to entice; she actually fears him. Her resistance causes thickets to grow in the desert. The thickets and “Labyrinths” (stanza 21) describe the state that is created when the Spiritual principle is led into the pursuit of the riddle of matter. We thus arrive at the stage where, of his four faces, Man presents that of reason, the Zoa begin page 189 | ↑ back to top Urizen.16↤ 16 S. Foster Damon, William Blake: His Philosophy and Symbols (1924; rpt. London: Dawsons, 1969), p. 297, and Raine, Blake and Tradition, I, 319-20. Also, Raine (I, 320) calls the activity of stanza 23 the building of “rational Rome,” an identification which we adopt. In this labyrinthine state roam the enemies of the spirit: the “Lion Wolf & Boar” (stanza 21), those animals that will flee howling at the incarnation, in stanza 25. In the Book of Enoch, in a dream-vision of Enoch, in which the history of the world is related with animal characters, these animals, among others, appear in the role of enemies of Israel: the boars are the Edomites, the lions the Babylonians, and the wolves the Egyptians.17↤ 17 R. H. Charles, The Book of Enoch (Oxford: Clarendon Press, 1912), p. 191: footnote to verse 9, p. 195: footnote to verse 42, and p. 199: footnote to verse 55. Blake made drawings for the Book of Enoch, first translated into English in 1821. The trees bring forth sweet Extacy. This state is called, in Thel, “the vales of Har” (4:10, E5, K129), and, in Tiriel, “the pleasant gardens of Har” (2:10, E274, K100) and “the lower garden” (8:1, E281, K109). In this state, Man is infatuated with physical forms, well expressed in the senile preoccupations of Har and Heva in Tiriel (2, E274-75, K100-02).18↤ 18 One sees in Har and Heva an aged form of Adam and Eve, watched over by the “now aged” Mnetha (Tiriel 2: 6, E274, K100), their nurse, or Mother Nature. All three of these figures are of course associated with the Natural principle: we recall that Adam (with Eve) is natural Man, while “Goddess Nature” is “Satan’s Wife” (Laocoön, E270, K777). In the second illustration to Tiriel, reproduced in G. E. Bentley, Jr., William Blake: Tiriel (Oxford: Clarendon Press, 1967), plate II, Mnetha is drawn in an elongated form, inexplicably so unless we take her to suggest the serpent. This illustration shows the advanced state, deep in the fall, of the Paradise Lost illustration, Satan Watching Adam and Eve (reproduced in William Blake: water-color drawings, Boston: Museum of Fine Arts, 1957), where Satan is shown with the serpent, his wife, coiled about him. Like the Romans at the time of the birth of Christ, Man wants to create “the good life,” independent of his eternal destiny. Thus, in the desert “many a City . . . is Built / And many a pleasant Shepherds home” (stanza 23). Man tries to establish “a joy without pain, / . . . a solid without fluctuation” (BU 4:10-11, E70, K224). The references to “Stars . . . nearer rolld” and “Shepherds” serve to remind us of the circumstances preceding Christ’s birth. When the birth of the Babe is discovered, it strikes terror “thro the region wide” (stanza 25). The Spiritual principle is now emerging from its sojourn in the “womb” of nature, where an integument has been woven for it, enabling it to exist in this world and declare its own nature. The spirit is no longer available to serve in the pursuit of earthly love and happiness. It will of course be tortured in this world. Thel, brooding over the self-contained processes of the womb of nature, innocently anticipates that she will once again “gentle hear the voice / Of him that walketh in the garden in the evening time” (Thel 1:13-14, E3, K127), the state of the spirit before the fall. However, allowed to view the incarnated state, she witnesses instead the suffering of the Boy, and flees back in horror to the safety of the vales of Har. With the birth and torture of the Male Babe, we arrive at the same event described at the start of the ballad. The last two lines, “She nails him down upon the Rock / And all is done as I have told” (stanza 26), suggest that the process continues in the way described in the poem. However, as we argued above, the cycle is merely a representation of the various states in which Man may find himself, and the apparent sequentiality is part of the metaphor used to represent contiguous states. The history of Man as a cycle from eternity to eternity is also recounted in Blake’s epic, The Four Zoas. 19↤ 19 See, for instance, James Evans, “Epistemology, Aesthetics, and ‘Divine Analogy’: A Study of the Poetics of William Blake,” Diss. Queen’s University at Kingston 1974, p. 147. We conjecture that there is a basic correspondence between “The Mental Traveller” narrative and The Four Zoas narrative. A sketch of the alternation of the Zoas, as we understand them to reach prominence as we traverse the Mental Traveller’s cycle, might serve to suggest an alignment between the two narratives, as indicated in Figure 2.
begin page 190 | ↑ back to top It seems natural to assume, with Roe, that all four Zoas, together with their Emanations, are present at every stage of Blake’s cycle, and that the predominance of any one depends upon the state of the cycle in which the Divine Humanity finds itself.20↤ 20 For interpretations of the Zoas and their Emanations, see, for instance, Roe, Blake’s Illustrations to the Divine Comedy, pp. 23-29, 165-71, and Milton O. Percival, William Blake’s Circle of Destiny (1938; rpt. New York: Octagon Press, 1964), pp. 18-46. In The Four Zoas, Night 9, seven Zoas and Emanations are named as they arise from the feast, while Urizen is in the vicinity (E385, 388, 390; K372, 376, 377). In eternity, the Emanations are absorbed in their respective Zoas, but at the fall they separate and progressively reject eternity until the limit of opacity is reached and the incarnation takes place. It will be useful to visualize the Zoas, the “Four Faces” of Man (Jerusalem 98:26, E255, K745), round the four sides of a head, as in Blake’s drawing Ezekiel’s Vision (William Blake: water-color drawings, Boston: Museum of Fine Arts, 1957, n. pag.). When one face is fronting us, the two faces on either side are seen in profile, and the one at the back is not visible. Luvah is the Zoa who presides over the apocalypse. However, his face already begins to show (as Orc) with the birth of the Spiritual at the incarnation. Similarly, the face of Urthona starts to take shape at the apocalypse, but will only be fully exposed as the heavenly Father when the eternal company is gathered for the divine feast in Eden. In Eden, the face of Tharmas, the Zoa in terms of whom the fall is described, is already appearing. And at the fall, the face of Urizen comes into view, but will only manifest frontally when reason is dominant and trying to establish the earthly paradise.21↤ 21 Blake’s diagram, “Miltons Track” (E132, K523) in Milton 36, depicts the Zoas in a cyclic order which is the mirror image of that shown in Figure 2. His fourteenth Job illustration, When the morning Stars, shows the regions of the Zoas arranged around the central figure in accordance with the order shown in Figure 2. We turn now to possible equivalents of the cycle of “The Mental Traveller” in Blake’s pictorial art. Like many of Blake’s works, the designs discussed below demonstrate Blake’s belief in the co-presence of the Natural and Spiritual principles in Man. Also, like “The Mental Traveller,” these designs are apocalyptic visions which not only describe Man’s destiny in and through the Natural, but also complete his destiny by imaginative inference of the Spiritual or Divine. In the title-page to his Job illustrations, Blake chose to arrange the seven angels in a semi-circular form. If we superimpose this half-circle onto the bottom half of the circle in Figure 1, it covers that part of the cycle that stretches from the fall to the apocalypse. We agree with Damon that the seven angels are the seven Eyes of God, and that they are seven states which “were divinely instituted so that man should mechanically be brought back to communion with God.”22↤ 22 Damon, William Blake: His Philosophy and Symbols, p. 224. The first Eye, Lucifer, is the angel associated with the fall. He looks out of the page, a glance followed by most of the angels coming after and indicating the error of turning outward towards the natural. The bottom angel, Shaddai, is given a prominent position and provides the pivot for the upward movement which is to follow. The seventh Eye, Jesus, looks inward toward the recognition of the eternal forms. The top half of the circle is present by implication, for it is not visible to our vegetative eye. The eighth Eye is, however, not invisible to the poet who has experienced the apocalypse in imagination: appropriately, it is discovered in Milton. There it is the “Eighth / Image Divine tho’ darken’d” (15:5-6, E108, K496) that accompanies the “Spirits of the Seven Angels of the Presence,” and the “Shadowy Eighth” (20:47, E114, K502). It is called “Shadowy” and “darken’d” since it is entering the region wrapped in darkness from the understanding of natural Man. Turnd round the circle of Destiny . . . Some critics incline to view the circle of destiny as a purely natural cycle, one which Man can traverse repeatedly until escape is possible through a process of rebirth.23↤ 23 For instance, Percival, p. 12, and Roe, p. 21. Paley (Energy and the Imagination, pp. 122-23) similarly indicates that Man, to be regenerated, must break “a bound circle.” The implication is that the circle of destiny is attached to a separate supernal cycle. It is our contention that the supernal cycle is not separate from the circle of destiny, but intertwined with it. That is, there is but a single cycle, and the circle of destiny, which Tharmas turns round, is but the natural component of the cycle, in complementary relationship with the supernal component.24↤ 24 Blake talks of “the vast form of Nature like a serpent . . . ” (Jerusalem 43: 76, E190, K655). The natural component of the cycle is thus aptly represented in versions of the Uroboros in which the serpent’s body is thick in its middle and thins out towards its ends (see, for instance, Carl Jung, Psychology and Alchemy, Collected Works, 2nd ed., Princeton: Princeton University Press, 1970, XII, p. 103). The implied complementary serpent, thickest where the serpent of nature is thinnest, and vice versa, represents the spirit. In the frontispiece to Europe, then, the divine figure depicts the face of Man at the stage when we enter the fall and meet our earthly destiny. At this stage Tharmas is dominant, and it is he who can say: “Return O Wanderer when the Day of Clouds is oer” (The Four Zoas, Night 1, 5:12, E298, K266: 75). The cogency and centrality of the theme of Man’s fall from and return to Eden in other work of Blake may be pointed out briefly, if superficially. The title-page for the combined Songs of Innocence and of Experience depicts Adam and Eve being turned out of paradise: the first series consists of songs in which the joy of paradise is remembered and expressed through correspondent symbols in this world; the second series consists of songs in which eternity is forgotten, and Man makes his bitter progress towards the point where hope of regeneration has to be introduced. The 16 plates of The Gates of Paradise emblematically tell the tale of travel through the fallen world, from the exit gate of paradise round to the entrance gate. The early prophetic books describe various portions of the journey. The myth of The Four Zoas spans the entire begin page 191 | ↑ back to top cycle; this myth is condensed and re-worked in Jerusalem. Milton focuses on the apocalyptic event within the poet. Even in his incidental illustrations, Blake frequently chose material related to the cycle, for instance, The Pilgrim’s Progress, and Paradise Lost and Paradise Regained. Judith Rhodes has shown that the 12 illustrations to L’Allegro and Il Penseroso may be arranged in a circular form with striking correspondences to the cycle we argue for “The Mental Traveller.”25↤ 25 Judith Rhodes, “Blake’s Designs for L’Allegro and Il Penseroso: Thematic Relationships in Diagram”, Blake Newsletter, 4 (1971), 135-36, reprinted in Robert N. Essick, ed., The Visionary Hand (Los Angeles: Hennessey & Ingalls, 1973), pp. 449-51. Blake’s various versions of his picture A Vision of the Last Judgment make a radical connection between the eternal journey as a cycle of fall and return, and the eternal journey as the form of Divine Humanity.26↤ 26 See “Blake’s Visions of the Last Judgment,” a pamphlet issued by Blake Newsletter, An Illustrated Quarterly for the MLA Blake Seminar, 1975. At the top of the picture Jesus is shown seated on his throne in paradise. The fall takes place on the right, in the form of figures falling downward. At the bottom, beneath the “dragon’s cavern,” lies Albion, who is awakened by his wife. The resurrection into paradise is shown on the left, in the form of figures moving upwards towards the throne of Jesus. We are fortunate to have Blake’s description of a version of the picture (E542-55, K442-44, 604-17), in which he emphasizes the mental nature of his vision. For instance, the falling and rising figures, with biblical names, are meant to represent “the States Signified by those Names the Individuals being representatives or Visions of those States as they were reveald to Mortal Man in the Series of Divine Revelations. as they are written in the Bible these various States I have seen in my Imagination when distant they appear as One Man but as you approach they appear Multitudes of Nations” (VLJ, E546, K607). In the version of the picture which is in the Rosenwald collection, the details of the picture do dissolve into the outline of this “One Man.”27↤ 27 Ibid. Blake writes: “All Things are comprehended in their Eternal Forms in the Divine body of the Saviour . . . The Human Imagination who appeard to Me as Coming to Judgment . . . throwing off the Temporal that the Eternal might be Established” (VLJ, E545, K605-06). The Last Judgment is thus viewed as a process in which the divine spirit in Man leads him to discard the states of error and to reach his eternal state, which forms his true home, the place “Where the travellers journey is done.”28↤ 28 “Ah! Sun-flower” (E25, K215), another poem with a “curious circular movement” (Rosemary Freeman, English Emblem Books, London: Chatto & Windus, 1948, p. 28). A final design may be mentioned: the watercolor picture, Ezekiel’s Vision. Here, as in the title-page to Job, Blake configures the Eyes of God in the lower part of a circle. As in A Vision of the Last Judgment, the eternal cycle is equally the human form. These motifs, along with that of the four faces of Man, combine to make the Ezekiel design a comprehensive vision of Man’s eternal form. It is a symbolical reading of the Bible, as Blake’s own commentary on A Vision of the Last Judgment suggests, that makes it possible to interpret cohesively his most challenging works. Robinson reports that Blake “warmly declared that all he knew was in the Bible; but then he understands by the Bible the Spiritual Sense” (BBR 322). Blake held that “The Old & New Testaments are the Great Code of Art” (Laocoön, E271, K777). The biblical narrative, seized as a whole and transfigured into a ballad, is complete and cohesive in “The Mental Traveller.” Any more restricted reading entails internal contradictions or indicates interpretations contrary to Blake’s distinct theological ideas. Because “The Mental Traveller” is a radically compressed version of Blake’s most important theme, that of Man’s fall from and return to Eden, and an audacious announcement of reality’s mental nature, a mastery of its form and its visionary conceit is, in microcosm, a mastery of Blake.